My mom brought up a phrase the other day: “Surrender the Outcome.” In many ways this is a theme that has been repeating itself to me frequently lately. It kind of started the day I gave the $10 to the woman on the streets of Seattle just before I left. I saw her with the sign begging for help long before she saw me. I watched her and saw her look of desperation, but there was no doubt that she also could have been addicted to drugs or an alcoholic or something. I knew right away that I wanted to give her something, but I checked my thought process first. I’ve seen many people I know hand money to people and demand that they use it only for food or shelter, not drugs. Naturally I didn’t want her to go buy some meth, but when I handed her the money I let go of the outcome. I detached. I did what I could and hopefully her daughter slept in a bed that night. I’m not usually very good with this. When I would write a story at work, sometimes I would lie awake all night worrying whether my bosses would like it or whether my sources would be mad in the face of negative publicity. I never let my worries affect my story–the truth always won out, but sometimes I would make myself physically sick over the thought. It is really such a minor thing to think about and worry about. Some things, I guess are easy to surrender the outcome. We all throw out smiles to strangers on the street every once in a while. If they don’t smile back or give a strange look or turn away the outcome affects us for only a short time — if at all. But it becomes more difficult in other areas. When I would go for job interviews I would make myself ill the night before and after the interview until I heard one way or the other on a job — even if I had decided I didn’t want it. I was incapable of surrendering the outcome. I can only imagine what it would be like to be a parent. Surrendering the outcome of years of parenting and love seems nearly impossible. This week I was thinking, though, that surrendering the outcome, detaching from what happens next is the only way to remain sane. I’ve heard pastors and politicians and celebrities all vocalize the importance of the outcome. But my belief is we have no control over what happens next. My dad used to say to me in school (when I was freaking out over some quiz or test) “All you can do is all you can do.” I suppose sometimes we question whether we did all we could, but I’m trying to teach myself to let go. To do my best and do what I know is the right thing and release the outcome. I can’t control it anyway. I’ve never been big on entering contests. Yes, I have been obsessively entering contests to win a Kindle for the past, oh, year-and-a-half. But in general I skip them. At drawings at church functions or social functions I never seemed to win. One time at a women’s retreat everyone but two people would be drawn from a basket. I was one of the two. Haha. At another women’s retreat everyone got a prize. I won a haircut at a barber shop. Again haha. 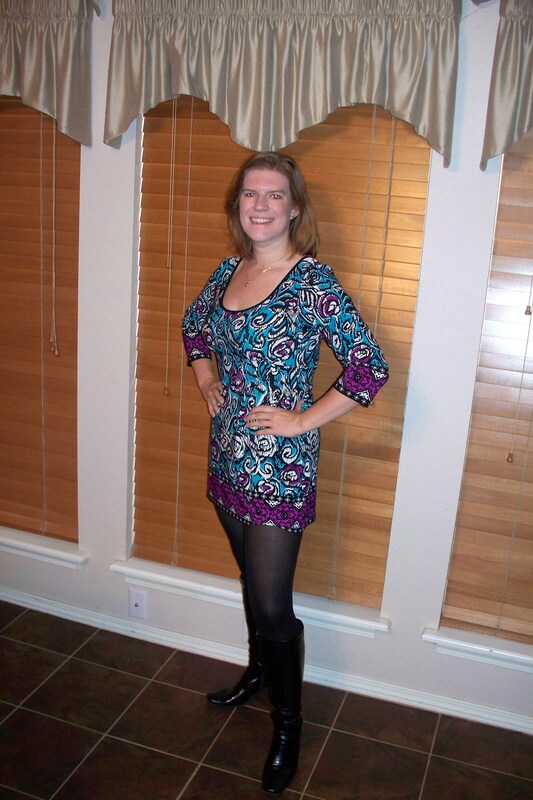 But I recently entered Weight Watcher’s Inspiring Stories contest. I think it is a great contest and I have no clue what my chances are at winning, but I felt a boost of self-confidence just taking the pictures, writing my story and entering. I only wish I had more words (we were limited to 400). I guess a writer always needs more space. The prize for the contest is $5,000 for a new wardrobe, a trip to NYC and a fashion consultation with Tim Gunn. But overall, it doesn’t matter all that much whether I win the contest or not. I can’t even believe how much I’ve changed over the past several years. I think I know where I am going long-term. I am enjoying my current job and posses more self-confidence than I have in a long time. I am still not sure exactly who forms my “everybody.” I’m still thinking about it. But I do know a few. A few surprises and a few givens. What I recently realized, though, was that was what was going on with the writing I’ve been trying to do. Wondering what “everybody” will think or feel about it. Wondering whether my group of everybodies will approve. I’ve always been a people pleaser and I was trying to do so in my writing. So for now I’m going to just write whatever I want and maybe I’ll never show it to anyone, but I think giving myself permission to keep it a perpetual secret will help. Likely some will not like it if they were to read it. But I’m trying to let go and just please myself and find my own writing voice. It seems like another big change for me. Though not outwardly visible it is a change for my internal thought process. For a few months I felt like that. Like I was falling. It is hard to describe more effectively but I made the decision to quit my job at the Peninsula Daily early this year in order to pursue whatever career is out there. Some people didn’t understand this decision — quitting in such a bad economy doesn’t seem like such a good idea. And everyone has an opinion about what I should be doing. How I should be spending my time. One of my goals is to do some more writing. I haven’t said that publicly, really. I tend to panic with too much pressure and it seems like all eyes are on me sometimes. People who I have told are constantly asking me how it is going. I can’t describe what it is like to sit down and feel all the disapproval or high expectations. I suppose this is why a lot of authors have trouble with their second work. So many expectations. But back to my story. So from the time I made that decision I felt like I was falling and falling. Not in a bad way but in that sort of “rush” way and that way that gives a burst of adrenaline. I was completely at peace. I knew everything was going to work out. When I was in Cali visiting my cousin Deana I couldn’t find my prescription sunglasses. I had no idea where I left them or where I could find them. But I wasn’t worried at all (those of you who have seen me lose my keys know that this is not my normal response.) I was sure that they would show up. And they did. I also wasn’t very worried about finding a job when I got back to Texas. I was sure something would show up. And sure enough something did. But something changed along the way. At first I was writing and exercising every day. I continued to go to work and juggle everything but I was at peace. I still had that sensation of the wind on my face and falling. I never felt like I “hit the ground” or anything, but somewhere along the way I started to panic again. I feel nervous and a little scared about my future again. I am obsessing at night and worrying about everything. I haven’t written or exercised in a month. There is this exercise in a book I read once where you envision what you want to happen. You work very hard to imagine every single detail. You go as far as to write it down and cut out pictures and make a visual of it. And then you say “It’s done, thank you.” And you don’t put up your visuals or look at your writings. You forget about it. You let go. So I think I’ll let go of all my doubts and fears and uncertainties. Not sure how exactly, but here goes nothing. Maybe I can get that falling feeling back for the rest of my life. So this weekend I found several boxes of my stuff stored at my parents’ house. I didn’t even know they were here!! From the time I was a small child I wanted to be a writer. I fiddled with tall tales, poetry and “chapter books” (those were really more like sentences on separate pages, but ya know!) Here are a couple of poems I wrote when I was 8 and 9. Clearly I was obsessed with the sea for some reason haha. I don’t think I did too bad for a small child! I’ll scan some of my books and post later but for now enjoy the poetry! Pew, I smell someone’s dirty socks! That’s at Sea, Sea, Sea! Thanks to a really good conversation about some Bible things at my writing group on Monday (Thanks, Adam) I have been thinking a whole lot about some really strange topics. I started rereading one of my favorite books “Saving the Appearances” by Owen Barfield. It is a book on religion, God, people and the changes we’ve gone through as a human race with regard to religion. But not on a historical level. More on a mentality level. It is a little esoteric but I love how radical his ideas are without even seeming radical. Some people would probably disagree with him a good deal and more probably would if they really understood what he was saying. But all that is background to my mental state. Haha. I was thinking really hard today about prayer. I remember praying and prayer lists from the time I was little. There are plenty of people who believe prayer is just a way to make yourself feel better. Or that there is no God so it doesn’t matter. Others believe in a God who is disinterested in our lives or at least “hands off” and others think that every prayer is a letter to Santa asking for more presents. Still others think it is a practice that is good for you soul and that sometimes the answer is no or there is no answer at all. To be honest I’ve been pondering is what is the purpose of prayer. I’m not talking about prayer in a group out loud with other people. I’m talking like a private conversation. Not even the conversation part, but the request part. What is the purpose of a prayer request? (I’m not asking in a hopeless “what is the point of it all” way but more in an intellectual question way.) My whole system of beliefs has changed a great deal since high school. . . and yet in some ways not as much as it would seem. But this is a question I’ve never been able to answer. Even when faithfully praying every night. If you believe that God’s will is going to happen then what is the point in God asking us to ask for it? I’m asking for opinions here not answers. Not trying to convince me or others of the greatness of prayer. Just why does it do any good. Will you change God’s mind? Is it for personal growth? I know this is super nerdy of me, but I have always loved research and part of me would like to write a research paper about this as I read through one of my favorite books on religion (I almost said theology, but Barfield is almost more than theology.) I think this tendency is why Andy Tyler used to suggest I go to seminary. haha. Input? I know I have plenty of people who don’t believe in any of this, so you guys don’t feel like you have to respond if all it is going to be is putting down religion. I’m asking on a purely intellectual level not on a debate level, please. 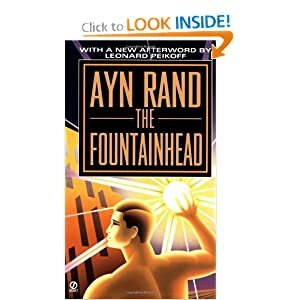 I originally began reading “The Fountainhead” because a friend of mine said it was her very favorite book in the world, but it had been years since she had read it. So the two of us planned to read it together and compare thoughts and opinions. I had also heard all sorts of rants and raves from people of all sorts of different political opinions so I was curious. If I really wanted to delve into Ayn Rand’s political world I, perhaps, should have chosen “Atlas Shrugged,” but then again, that wasn’t my friend’s favorite book. I’ll try to do this without too many spoilers and then give warning once I’m getting into the spoilers part. The story revolves around architect Howard Roark, who is dedicated to his own style of architecture (he detests the use of the word “modern” for his style.) He will not compromise on his buildings — they must be done exactly as he designs them. He is a true individualist who lives only for himself. He does not desire fame, glory, fortune any more than he fears, poverty, pain or criticism. I suppose I shouldn’t say he doesn’t want them, but he doesn’t live for those things and doesn’t see the point in thinking about them. We also see his character foils in his classmate Peter Keating, who lives for the approval of others, and Ellsworth Toohey, who lives for the collective good of others. We also read about another architect who tried to live for himself and failed, Henry Cameron, who was destroyed by his attempts to live in such a way. Gail Wynand is a man that “could have been” according to some of Rand’s notes. He lives for power, but sees the value in Roark. Also involved is Dominique Francon, who loves and is loved by Roark, but also seeks to destroy him. In all if I hadn’t started the book with sooooooo much context and opinion surrounding it, I probably wouldn’t have even thought that much about it. I love theme and I would have noticed, of course. (She does, after all, dedicate nearly a whole chapter to allowing the protagonist to go on a long speech basically laying out her philosophies.) But that isn’t the sort of thing that upsets me in books. Literately, I think the book was solid. The characterization was one of the best I have read in a long time and I appreciate that because so many characters in so many books are the same exact people that you read about over and over and over and you see on TV every day, and they are flat. But these characters were fleshed out. I was surprised because initially I was annoyed that we had very little to no information about the characters’ back stories (except for the antagonist, who we do learn about his childhood.) But most characters when we meet them is where we start, we learn almost nothing about their families or how they came to be how they are. It does bug me a little, especially about Howard Roark — how does one becomes such an avid Individualist? Besides learning that he grew up poor and that his dad was a longshoreman, we know nothing about him and how he learned to be how he is when we meet him in architecture school. So I made an ending to the story, and we played something, but I don’t think we went to ride horses that day. I wish I could remember all the crazy stories I used to make up for my little sister (back when she was both my “little” sister and as she always will be my younger sister.) I’m sure they were hilariously bad, but it would be fun if I could remember. My grandma took me to see her in the hospital and I got to hold her for a little bit. We had to sneak in because in those days children were not allowed on that floor of the hospital. I think back then I thought Stephanie was something like a new toy that I would get to bring home that was “mine” and at times I was quite bossy with her, which isn’t really my nature. On her 27th birthday, I hope the very best things for her, that all of her dreams come true and that life brings her good things. I was also thinking this weekend about another kind of symbolism and me. The messiness that once plagued me. Since arriving home I have kept my room perfectly tidy. It hasn’t even gotten a little messy. But many of my friends and family can attest that wasn’t always the case. I am often teased about this (many times because I used to make fun of myself for it — mostly out of my own shame. I guess I thought if I laughed first it wouldn’t hurt as much when they laughed.) But the messiness, I’ve come to believe was a kind of outward example of my own inner messiness. One time a friend of mine in Brazil said that to me and I was furious with him. I thought, “No, sometimes I’m just messy.” But I think my fury was just an acknowledgement of how right he was, at least in my case. Right now I am at peace. I am happy with where I am. There are things I still struggle with, of course. Life is never a cake walk. But I feel like I am following the path I am supposed to. I’ve never been at peace with my place in life before. I’ve always struggled before. I’ve always felt in turmoil as if being tossed about by the ocean. So I suppose it is no surprise that my space reflected that. People still tease me about my former messy way. I suppose they don’t know that I’ve changed. It has only been a short while, after all. And those memories, even just of the mess, are painful. Maybe someday, I’ll figure out a way to ask them to stop the mockery. What do the things that mean a lot to you say about you? What about the things that embarrass you? Well, today I reached a long-time goal of mine. It is not my final weight-loss goal, but it is the goal at which I can become a “lifetime” member of Weight Watchers and for now it is where I will work to maintain. For the first time since 7th grade I am at a healthy BMI. It is so strange. I don’t feel like I ever looked *that* bad, but I definitely was at a point that I felt pretty bad. I’ve lost nearly 55 pounds now. Isn’t that crazy? It almost seems impossible. Almost like I’m exaggerating. When I was yo-yoing I would always say I had lost 10 pounds. Well, usually I had. 10 pounds from something. Maybe I had gained 20 and lost 10 or up and down and up and down until I didn’t know where I was. I had a friend that even teased me once. She said “every time I talk to you, you’ve lost 10 pounds.” After that I stopped talking about weight loss. 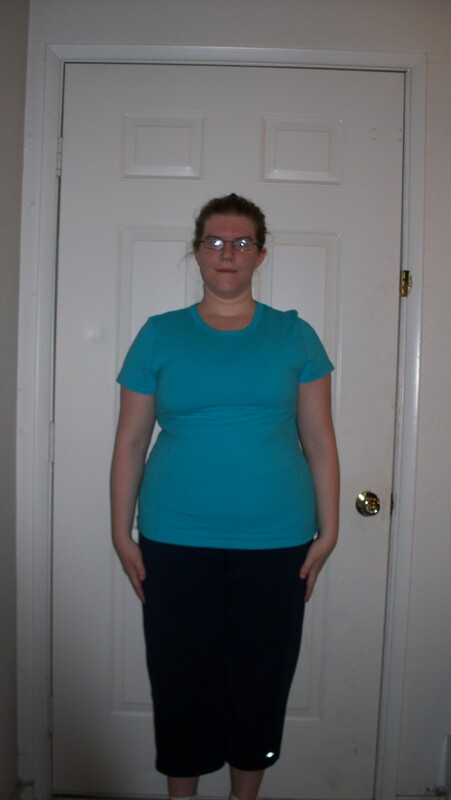 For a while I gave up completely and that is when I got to my worst, but then since Lyndi convinced me to join Weight Watchers in November of 2009, I’ve slowly lost weight. Sometimes it was 0.2 pounds and sometimes I gained. But this week, with a 1 pound loss I was finally within a healthy range. And I think I look pretty good. If I said my weight here, many women and men would think I was still “fat.” I would say many women still strain to be 110, 115 or so. But I’ve accepted that will not be me. I am muscular and curvacious in ways that my body will not hold up to that kind of weight. It would not be healthy. I don’t even desire that. But I’ll be honest. When I was 12 years old or so and thinking about what kind of body I would want to have when I was a woman, it was exactly the body that I have. I am happy with what I am blessed with. I like the smallness of my waist and the curve of my hips. I even like my muscular legs (even though zip-up boots rarely work for me) But I’ve never had the desire to starve myself to be a waif, or over-exercise to be something I’m not. I am what I am and I’m happy with that. I just want to be the best version of myself, the most healthy one possible. We will see what that ends up being. 🙂 For now I’m celebrating feeling better than I have in years and having the numbers at last reflect that. What a crazy long weekend. And I mean “long” in multiple ways. My weekend started out average on Friday. I worked a bit from home and then spent some time with my parents. I also read over my friend Adam Gibbs’ manuscript “A Great Story.” And it was great. His project and enthusiasm is inspiring in ways that I can’t even express. Sometimes for me as a writer it is difficult to see other writers so inspired and making so much progress, especially when I am feeling stalled (which I am right now) but I am so genuinely happy for Adam and the manuscript is so enjoyable that there is truly no jealousy. So that is such a happy thing for me as well. To see a friend succeeding. Then my weekend got crazy. My Grandpa Lloyd fell down in the backyard while outside with his little dog Matt. I think I understood something about swatting at some moths or something. Grandma had her hearing aid out so it took a bit before she found him. At first they thought he was just bumped up and bruised but the next day they summoned an ambulance because he couldn’t even get out of his recliner. Turns out he had broken his hip and would need surgery, but first he needed to thicken up his blood because he had been on blood thinners before. Then I went to my class reunion. Some might not agree, but I really did think it was a success. I will most definitely help with the planning of the 20th reunion and was excited to see everyone. I looked forward to it very much (as my friends can attest) and it was a lot of fun. I was sad that my little group of friends wasn’t able to make it, but for me I liked seeing all the rest of the people there. What struck me was 10 years ago we were all pretty much in the same place. Leaving Canyon High School. We were all pretty much in the same stage of life. But now we are all over the place. Some of us are married with four kids and some (like me) are single. Some have moved to the edges of the earth and some never plan to leave Canyon. It is fascinating to me to see everyone interacting again. I know that on facebook you can see all these people and find out what they look like and whether your high school crush is married or gained weight or whatever, but there is something even more interesting about seeing this group of people in the same room together. I thought so anyway. Others will disagree. I slept in on Sunday, Saturday was such a late night for me! And I went to go see Grandpa up at the hospital. Then Monday (the Fourth) he went in for surgery and was out within 15 minutes! Apparently they just screwed the bone together and were done. Not sure yet what rehab will look like for him though. I am glad to be back closer to family so I can go up to the hospital at times like that. Later on Monday was the Pletcher family cookout. I sat at the kids’ table (as usual) and got to talk to Trey. One of the busiest holiday weekends in a long time — including the ones where I worked! 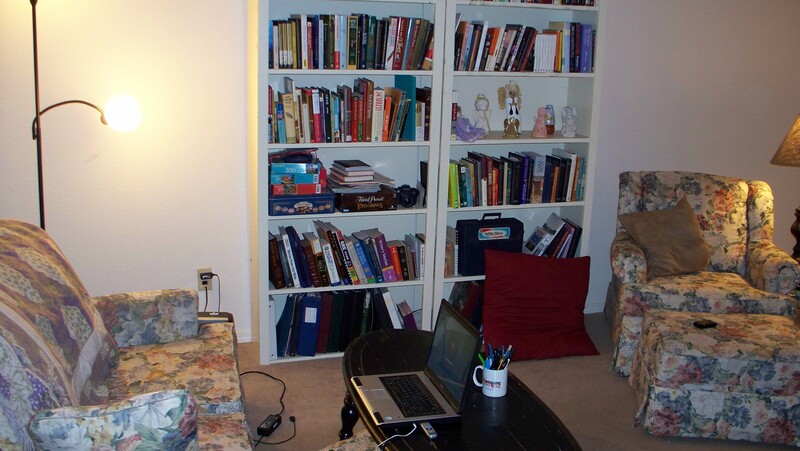 Get free books with me on Paperback Swap.